Is Microtransit a Sensible Transit Investment? It’s “microtransit week” at Human Transit. Last weekend I asked if microtransit is a new idea and whether this matters. I’ve also explored the question of whether apps transform the economics of transport in a fundamental way, which is an important part of the microtransit conversation. Today, I attempt to put microtransit in the context of the goals that usually motivate transit agencies. This is all part of my attempt to figure out what advice I should be giving transit agencies, all of whom are being encouraged to do microtransit pilots. Your comments will affect how I think about this, and what I advise transit agencies to do on this issue. What is a transit agency trying to do? What goals animate its activity and justify its use of public funds? In my career I’ve watched many planning processes that seemed to dodge those questions. Over and over, I watched people try to define goals backward from projects (“what goal will make this cool thing I want look like a good idea?”) rather than forward from things that taxpayers and citizens actually care about. My book Human Transit grew from that problem. So let’s try working forward from typical transit goals, and see where we end up on the microtransit question. Transit is expected to do many things. These things generally fall into one of two opposite groups of goals. Ridership goals are met when a transit agency achieves maximum ridership for its budget. Ridership goals include emissions reduction, congestion relief, reduced subsidy per passenger, support for dense urban redevelopment. Ridership goals also mean that the transit agency is offering useful and liberating service to the greatest possible number of people. Coverage goals are met when a transit agency meets people’s needs or expectations even though low ridership is the predictable result. Coverage goals include social service goals that assess people based on how badly they need something rather than how many of them there are. Coverage goals include political equity — the desire that every electoral district or municipality gets a little something. Finally, coverage goals can be associated with agendas of upward redistribution: Intentionally low-ridership service may be run because people who benefit have the influence to force the transit agency to do it. The goals fall into these two categories because the kind of network you’d run is totally different in the two cases. If you want ridership, you run big buses and trains offering frequent services in places with high demand. If you want coverage, you spread service out so that everyone gets a little bit, even though it’s much less attractive. I explain why this is in more detail here. My original Journal of Transport Geography paper introducing the ridership coverage tradeoff is here. In my work with transit agencies, I encourage them to be conscious of which kinds of goal they are pursuing. I advise transit agency boards to adopt a clear policy about how their operating budget should be divided between these goals. For example, our much-discussed Houston redesign began with a Board decision to shift the agency’s priorities from 55% ridership to 80% ridership, which meant cutting their investment in coverage from 45% of their budget to 20%. Note the reality I’m working in here: Transit agencies have limited budgets. I often hear dreamy talk about how microtransit isn’t in competition with fixed routes. “It’s not an either-or,” people say. “They can all work together.” Well, they may not be competing for customers, but they are competing for funds. When a transit agency invests in microtransit subsidies, it is doing this instead of running more fixed route service. That’s the frame in which we must understand these microtransit proposals, at least the proposals being put forward now. The last four rows in this table are services that would not exist if the only goal were ridership. (Paratransit would be provided only as required by law, not in excess of that.) If you run those services, it can only be for a coverage goal, where low ridership is the expectation. So, it is absurd to claim that investing in microtransit is a way to combat declining transit ridership. In any transit agency, there is a place where an hour of fixed route bus service could attract 10-100 times as many passengers than an hour of microtransit could do. If you want ridership, you’ll invest more in that bus service, not in microtransit or any other low-ridership service. Now, suppose we do have a coverage goal. We’re talking about a low-density, unwalkable suburban area where ridership expectations are low for whatever service we might offer. If the goal were ridership we wouldn’t serve this area at all. In most agencies, the worst-performing suburban fixed routes typically pick up about 10 people for every hour a bus operates. Even in the context of coverage goals, those routes are hard to defend. So given a coverage goal, which is the opposite of a ridership goal, the thought process for whether to invest in microtransit might look like this. Flexible routing is always inefficient compared to fixed routes. You don’t really need data, although there’s plenty, to understand this geometric point. On a fixed route, passengers gather a bus stop, so that the bus can run in a reasonably straight line that many people will find reasonably direct. This saves the bus and driver time, so the bus can get to more potential passengers, and take them to more useful destinations, in each hour it operates..
On flexible service — including microtransit — the transit vehicle meanders to serve various points where people have requested it. This inevitably leads to more driving for fewer customers than a fixed route. There is simply no way that a flexible-route service is going to pick up 10 people per hour of operation in a low-density suburban setting. Maybe you can do it in the middle of San Francisco, but that’s not what we’re talking about here. The places where fixed route buses do only 10 boardings/hour usually have low density, long average distances, and circuitous street patterns, all of which are bad for demand-responsive service too. 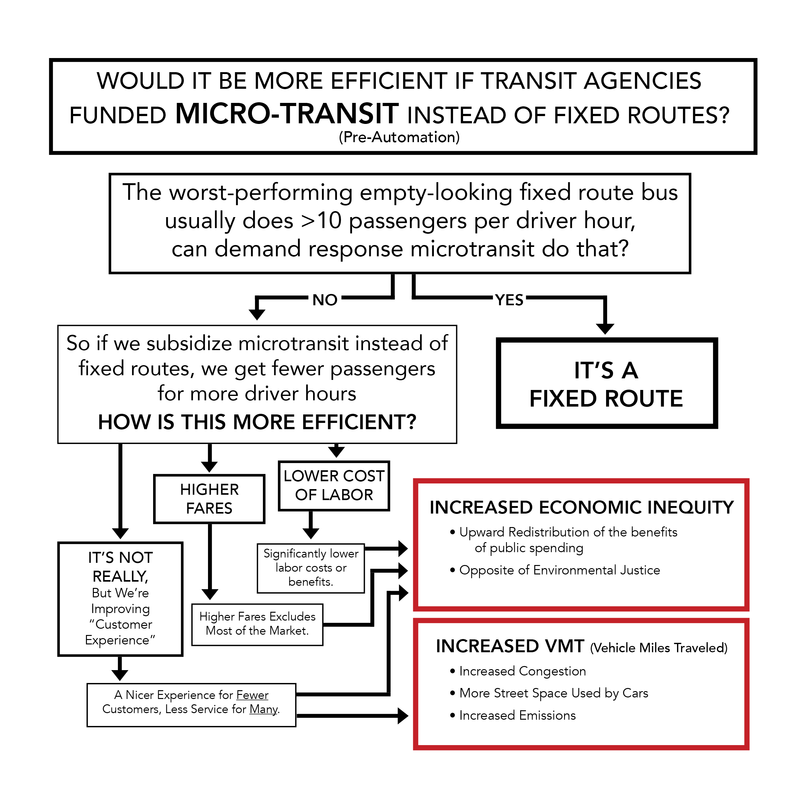 So even if your goal is coverage, why would you run microtransit instead of a fixed route? Since microtransit is reliably worse than fixed routes in passengers per service hour, what other kind of efficiency would make up for that, and make this viable? Higher Fares. Of course microtransit can run on its own in a for-profit model, along the lines of UberPool. In addition, it’s possible for transit agency subsidies to reduce microtransit fares somewhat below usual TNC levels without bringing them down to anywhere near transit fares; this is being tried in some places. But this can also be a dramatic upward redistribution: more subsidy is going to people who can likely afford TNC fares anyway. There are also possibilities to subsidize TNCs for disadvantaged persons, but transit agencies have limited room (practically and legally) to discriminate in these ways. Those kinds of subsidies would better come out of social service agencies. “Improving Customer Experience” Who can argue with that? But the question is: Whose experience, at whose expense? If transit agencies spend more money to serve fewer people, as microtransit requires, in order to give those fewer people an improved customer experience, well, why are those people so special? “Improved customer experience” sounds great, but transit agencies are in the mass transit business, so their customer service improvements need to scale to benefit large numbers of people. If they benefit only a fortunate few, this is pretty much the definition of upward distribution of the benefits of public spending, and hence increased economic inequality. (It can also expose transit agencies to all kinds of civil rights and environmental justice challenges, both political and legal.) In short, the “customer experience” talk seems to boil down to elite projection. All this time, I’ve been talking pre-automation. Does automation, whenever it’s really ready, blow all this away? Yes, you can erase the “increased economic inequality” box from the chart, but the “increased VMT” is still there. Because as always, if we’re putting people in more small vehicles instead of fewer large ones, we’re increasing Vehicle Miles Travelled, which means we’re increasing congestion and seizing more street space for the use of motor vehicles. Suburbs may be fine with that, but most big cities are not. There isn’t room. So Why Would a Transit Agency Invest in a Microtransit Pilot? Transit agencies sometimes do things that make no sense to transit professionals, because the elected officials at the top order them to do it. Right now, everyone’s talking about microtransit, so of course many elected officials are talking about it. But in my experience working with countless elected boards and officials, it’s usually possible to steer those impulses into a conversation about goals. “When you say you want this new thing, what outcome are you really after? Are you sure this thing really does that? Have you thought through what the side effects are?” I’ve been having these conversations, about all kinds of cool-ideas-of-the-moment, for a quarter century. At this point, I cannot come up with a logical argument from any of the commonly-cited goals of transit to the idea of investing in microtransit pilots with transit agency funds. Even if the goal is low-ridership coverage, there are vanishingly few situations where flexible routing improves on the productivity of fixed routes alone. Meanwhile, all paths in my logic lead to outcomes that most urban leaders will find bad: Increase economic inequality, both through lower wages and through the upward redistribution of benefits, and increased vehicle miles traveled. And even if you accepted those impacts, the math just doesn’t work. That’s a provisional opinion, which is to say that it’s a really a question. What have I missed? But please, if you’re going to comment, engage with this argument. I have heard all the beautiful stories about microtransit. What I can’t figure out are the numbers. The last “microtransit week” post, summing up what I think we know on the subject, is here. Revised February 19, 2018, based on excellent comments. We’ve all heard that the most important transportation innovation of the century is the smartphone. Who can doubt that apps for ride-hailing, navigation, and payment are making it easier to use shared transportation services, whether buses or Uber/Lyft or anything in between? How can anyone who remembers waving helplessly at rushing taxis, or wondering when the bus would come, possibly doubt that this transformation has fundamentally changed all the products it touches? From a customer’s point of view, I don’t doubt any of these things. Apps have transformed the customer experience totally. But that says nothing about whether they’ve transformed the bottom line of the provider. The taxi industry that Uber is seeking to disrupt was never profitable when allowed to expand in unregulated markets, reflecting the industry’s low barriers to entry, high variable costs, low economies of scale and intense price competition — and Uber’s current business model doesn’t fundamentally change these structural industry characteristics. Taxi service, minus the protectionist regulations that kept some taxi fares artificially high. An app that expedites hailing a taxi and paying the fare. The relationship with drivers is also a difference, but not as much as it may seem. Uber and Lyft let drivers use their own cars, but many taxis are driver-owned as well. Both Uber/Lyft and taxis pay the driver based on fares, not based on hours worked. So really, the big difference is the app. The app has transformed customer experience — by taking the friction out of the hailing, routing, and paying — but it doesn’t seem to be transforming the fundamental nature of the task, or its potential to be profitable. That’s because transportation happens in physical space. The dominant element of cost is the time it takes to drive someone to their destination, and to travel empty between jobs. The app does nothing to change this. At most, Uber and Lyft have turned their efficiencies into fares slightly lower than taxis, due to intense competition between them. Every major ridesharing company in the world is still experiencing steep losses after five or more years of operation, including Lyft (U.S.), Ola (India), 99 (Brazil), and Didi Chuxing (China). We are seeing the same thing on the microtransit side. So far, microtransit is doing no better than demand-responsive transit has always done, generally worse than 3 passenger trips per driver hour, compared to 10 for the typical outer suburban fixed and 20-100 for fixed routes in dense and walkable places. In fact, the most widely promoted recent experiment, the Bridj pilot in Kansas City, did not reach 1 passenger / hour and managed to spend about $1000 per passenger trip, compared to less than $5 for a decent fixed route. This gap is too vast to be a marketing problem or something that can be solved by tinkering. It’s a fact about the intrinsic spatial inefficiency of demand-responsive service, which has little to do with the communications tools used. It’s time to notice a pattern: Tech boosters treat solutions to a communication problem as though they were solutions to a spatial problem. Certainly, communicating via telephone calls was part of the inefficiency of taxis, but if the smartphone app were enough to make taxis profitable, we’d be seeing the results by now. Likewise, it’s great that apps are improving the communications side of demand-responsive transit, but so far, there’s no sign that this is making a difference on the bottom line. 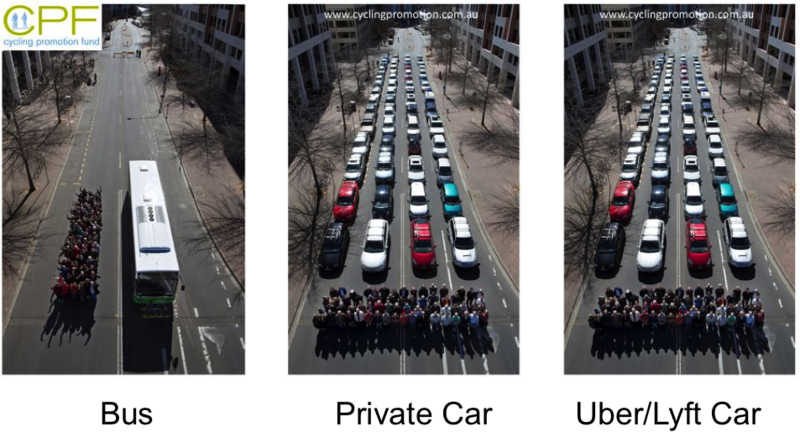 Remember: Urban transportation is a spatial problem, and (until automation) a problem of the efficient use of labor. If you’re going to transform it, you have to transform those things. Nothing about the standard Uber/Lyft product, or “microtransit,” is touching those fundamentals. So have apps transformed the customer experience of urban transport? Yes! Have they transformed the urban transport business? Maybe not so much. There is a vast range of hybrids between a fixed route and a fully “to your door” demand-responsive service, all of which are very old ideas. I was designing and revising these 25 years ago. Everything that’s known about the math of that problem was well understood back then by the people doing it. This appalling number is from Eno Center’s report “UpRouted: Exploring Microtransit in the United States,” p.7, which is generally upbeat about microtransit prospects. More commentary on this report soon. Caleb Pritchard at the Austin Monitor did a very clear writeup on my new talk on the impacts of microtransit (Bridj etc.) and ridesourcing (Lyft, Uber etc.) on public transit. In it, I push back hard on the notion that these services have any potential to “disrupt” public transit in any meaningful way, though there are potential synergies around the edges of transit’s mission. Read Eric Jaffe’s piece today on the effect of microtransit (UberPool, LyftLine, Bridj, Leap) on our cities. The question about all these private operators, seeking to create something between large-scale transit and the private car, is this: Are they going to work with high-capacity transit or try to destroy it? There are signs both ways. Consider the latter: Do we need to clarify the Americans with Disabilities Act so that the cost of complementary paratransit (which takes 20-40% of most transit agency budgets) is shared by all private transit companies operating in the space? Will we require private transit to do Title VI equity plans to prove that they do not discriminate against people with a low ability to pay? (That would be interesting, because neglect of low income people is intrinsic to most profitable business models, which is why you’ve never seen an airline magazine ad that appeals to low-income concerns.) The enormous burdens of Federal regulation — most of it designed to implement a civil rights agenda that’s theoretically endorsed by all sides — would have to be shared before we’d know who’s really best for which market. As Jaffe notes, the way forward is a difficult one for upstarts who are used to thinking of transit agencies as enemies. (It can also be difficult for transit agencies and especially their unions, who may have their own defensive and territorial feelings to work through.) The way forward is for less expensive service tools, including the upstarts, to focus on lower-density suburbia where the land use patterns make efficient big-vehicle transit geometrically impossible. The upstarts could even become contractors of the transit agency part of the time — paid to do things that they can do more efficiently than big buses can — as taxis often are today. And they can do this while also operating in the city at much higher price points than conventional transit, so that they aren’t undermining the space-efficiency of those existing systems. But when I hear the upstarts appealing to elitism, and derogating conventional high-efficiency transit, I wonder where we’ll end up … One thing is for sure: This sector is going to need strong regulation to turn it into a force for good. There’s room for hope. As I monitor how the upstart microtransit companies talk to their customers and investors, I notice that their early appeals to elitism and generalized transit-hatred seem to be giving way to more practical and inclusive messaging. Let’s hope the markets (and hey, that means you and your purchasing choices!) reward the companies that want to be part of a humane, sustainable, and efficient city.